It is easy to feel down-heartened about the state of Christianity in Britain today. Church attendance, we are continually told, is in free-fall, while practicing Christians are bundled out of the public square with almost celebratory haste. Yet the parable of the growing seed encourages us to look at the situation differently. The Kingdom of God is mysterious and unquantifiable. It cannot be measured, weighed or counted. It grows in secret ways and places that are foreign to the linear, rationalistic mind. Night and day it grows, whether we sleep or get up. We need eyes to see it though, and ears to hear, neither of which are easy to obtain in this spiritually obtuse age. The good news, however, is that signs of renewal can in fact be found all around us, often in independent, non-official, non-obvious places. The sacred art of Aidan Hart is one of these places. Hart was born in England in 1957, though he spent most of his early life in New Zealand, where he trained as a secondary school teacher and began practicing as a sculptor. He became a member of the Greek Orthodox Church in 1983, returned to live in England and started his career as a professional iconographer. He lived for two years as a monk on Mount Athos, then spent six years as a hermit in Shropshire. He is now married with two children. Hart's website - www.aidanharticons.com - illustrates the quality and quantity of his work as well as the sheer variety of his oeuvre: panel paintings, frescoes, carvings, illuminated manuscripts, mosaics, and more. He is also in demand as a teacher, speaker and writer, and his website gives numerous examples of his written and spoken work. 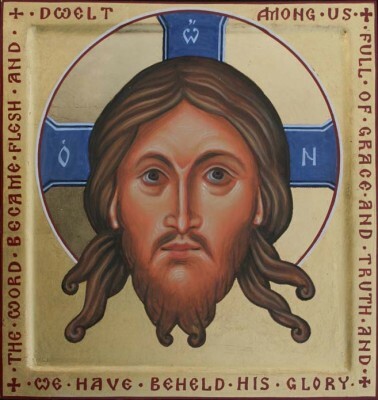 He has written two books, Techniques of Icon and Wall Painting (2011) and Beauty Spirit Matter: Icons in the Modern World (2014), and was elected a fellow of the Temenos Academy in 2015. 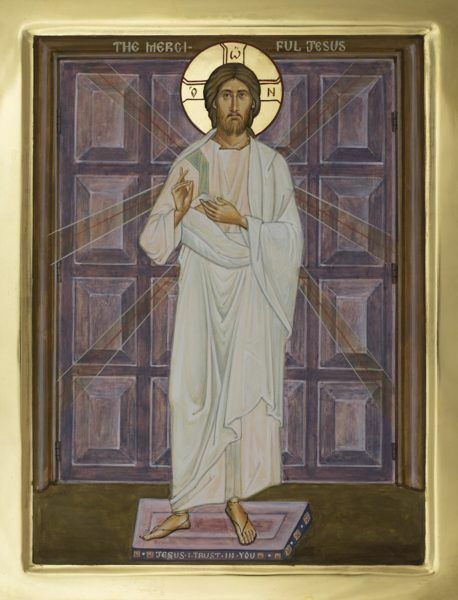 He now has over 900 commissioned works in private and church collections in over 25 countries. Hart's abundant body of work, emanating from the quietness of Shropshire and informed by his monastic experience, plays an analogous role, I feel, to the lives and work of St. Kentigern and the other British and Irish saints of the late Roman and early Anglo Saxon periods. This was a time not unlike our own in many ways, an age of uncertainty and incipient chaos, where the moral and social values that underpinned the Pax Romana for centuries were falling apart, undermined from within and without. St. Kentigern, as a young man, wanted to take a step back from the Empire's collapse, living a life of prayer, simplicity and solitude in a small cell near an extinct volcano. But as with the Desert Fathers and Mothers in Egypt a century previously, he discovered that others came seeking him, recognising in the life he was living something of the meaning, authenticity and integrity that the Western Roman world had to all intents and purposes already lost. Aidan Hart's work punches precisely at this level. People encounter it once, then come back for more, just as the men and women of the fifth century came to St. Kentigern. There is a depth and a seriousness to it, together with a joy and a radiance, that cuts right through the tightening mesh of contemporary life - the soulless bureaucracy of the state, the spirit-sapping squeeze of market forces and the adversarial, increasingly polarised nature of political debate. His icons speak the language of Truth, and people respond to that. When you look at his art, you feel at home. The human heart was made for God, irrespective of all the decline we see around us. It will always resonate - no matter how unconsciously or inarticulately - to an icon, a piece of music or a poem (Four Quartets again, for example) which speaks at that level.